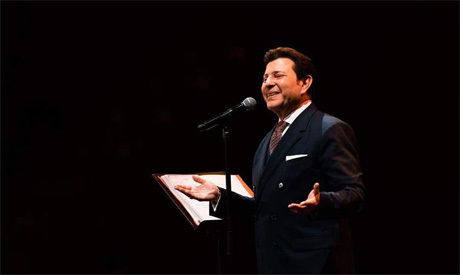 Egyptian song star Hany Shaker will mark Valentine's Day at the Cairo Opera House on 14 February, accompanied by a large orchestra under conductor Ibrahim El-Mougi. The head of the Musicians Syndicate since 2015, Shaker, 66, will perform some of his best known songs from his over 45-year career, including Ally El-Dehkaya, Lessa Betesaly and Yaritak Ma'ya. The Cairo Conservatoire graduate, who is considered an icon of romantic song, gained widespread fame with the 1972 hit Helwa ya Donia, written by renowned composer Mohamed El-Mougi. Shaker started his musical path at a time when some of Egypt’s musical legends were at their peak, including Umm Kulthoum, Farid El-Atrash, Mohamed Abdel-Wahab, and most notably Abdel-Halim Hafez, who greatly influenced Shaker’s musical approach. Shaker has collaborated with iconic composers like Yehia El-Mougi, Baligh Hamdy, Ammar El-Shereei and Mounir Mourad, and has appeared in a few movies including 1966's 'Sayed Darwish', directed by Ahmed Badrakhan, playing the legendary musician during his younger years. The concert tickets, which are priced at EGP 200, 300 and 500, will be sold online through the Opera House's official website. The concert will also feature singers Eman Abdel-Ghany and Walid Hedar in the first set.